Security - Kansas City, Independence, Lee's Summit | Pro Computer Solutions, Inc. Does The Threat Of Computer Viruses, Hackers and Malware Constantly Get In The Way Of Doing Business? "If I spend all my time worrying about every link my staff clicks on, I'll never get anything done!" Worried about things like this? With our all-encompassing Computer Data Security and Virus Removal solutions that bulletproof your company and its valuable data, you get protection from it all, as well as Virus Removal in case of an emergency. Our Wireless Network Security means your business is in good hands, so you can stop worrying about security and get back to business in Kansas City, Independence and Lee's Summit. Safety from hackers and viruses, with network security solutions that cover all your bases. A partner on your side for security, giving your company a high-tech solution to protect itself. 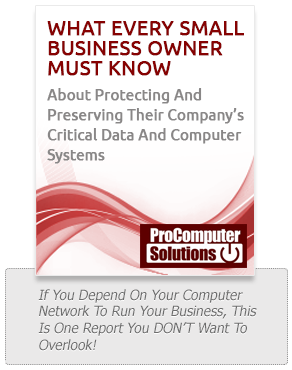 The consultants at Pro Computer Solutions are experts in creating security solutions that will fully protect your business from all that's out there. Providing companies in Kansas City, Independence, Lee's Summit, Blue Springs, Overland Park and Raytown, we provide Network Security solutions that take the stress out of data protection so you can focus on running your company. If your business needs help for computer data security, data security management, network and data security, Internet security, spyware protection, virus removal, wireless network security, or PC protection, we'll take care of everything. If your business uses the Internet, you’re already at risk for many of today’s real Internet threats. Defend yourself with our Computer Data Security and Virus Removal services before the Internet takes over your business.